Today's "must-have" is for the families in front of the camera. As an on-location photographer, I get to find great locations in their homes. One place in the house that almost always has potential is the master bedroom. A big king size bed can be great for pictures. For example, the contrast of a tiny little newborn on the bed really shows the baby's size. As I posted a little while back (My Day), letting a toddler jump and giggle on mom & dad's bed works great too. 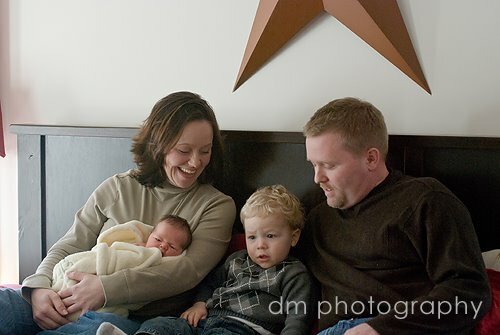 And a family all cuddled up on the bed, casual and comfy, can make such a fun photograph. Really, its a room in your house that should be considered!